If there is one vegetable that I can do without, it would have to be the cauliflower. To me, the taste is not anything to write home about. My fiance, on the other hand, likes all vegetables. Whenever he tags along on grocery trips, he endeavors to pick up at least one of every type of vegetable in the produce section. Consequently every couple months or so, I have this large cauliflower in the fridge starring back at me until I decide to cook it. Typically, we would have it blanched served with different sauces on the side or cooked in n indian curry, such as aloo gobi (potatoes and cauliflower.) Still, it wasn't something I craved. Then not too long ago, I prepared it au gratin, in a recipe that I typically reserve for potatoes or summer squash. What a difference preparation makes! I will admit, this way is much tastier than blanched and has opened up a new way for me of thinking about this vegetable. In fact, I look forward to experimenting with all the different and tasty ways in which this vegetable, that was once so low on my grocery list, can be prepared. The more I think of it, the more I'm grateful for my previous aversion to cauliflower; this way, my approach can be from a clean slate, or should I say, from a clean plate. 1. Mix all the ingredients for the toppings and set aside. 2. Cut the cauliflower in half and remove the hard stem. Proceed to break apart florets into two to three inch pieces. Place about 1 cup of the florets into a food processor together with the diced onion and garlic cloves. Mince thoroughly. 3. In a large skillet over medium high heat, add olive oil, minced mixture, bay leaf and dried thyme. Cook for 10 to 15 minutes until most of the liquid has evaporated and the mixture now appears dry and crumbly. Also, remember to stir frequently to prevent burning. Add the vegetable stock and cook for an additional 4 to 5 minutes. At this point, thoroughly whisk in the flour and nutmeg, and remove the pan from over the heat. 4. Steam the remaining cauliflower in a bamboo or metal steamer for three to four minutes, until slightly fork tender but not too soft. Toss steamed cauliflower pieces and onion-cauliflower mixture in a large bowl. 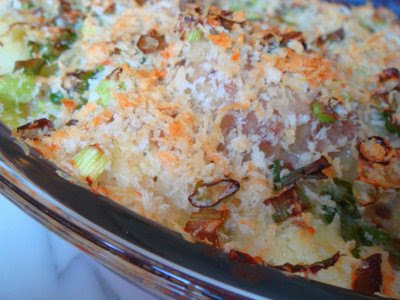 Pour into a baking dish and top with panko topping. Bake at 400 degrees F for 20 to 25 minutes. Cauliflower is one of my favorites, but I get bored with it! I love this recipe, a new way for me to enjoy an old favorite! Thanks Reeni! Glad you liked this take on cauliflower. i had to laugh at your husband picking up one of everything in the produce department :) i feel like that's a page out of my book! This looks great, have you tried roasting it?